The fossil came from a remote area of northwestern Alberta known as the Wapiti formation. Due to the fact that there are relatively few places where erosion has exposed underlying rock, the Wapiti’s rich fossil reserves have thus far remained largely untapped. Paleontologist Philip Bell of the Pipestone Creek Dinosaur Initiative is among the few investigators who trawl the dry riverbeds each summer, looking to see if the spring runoff has exposed any fossils. 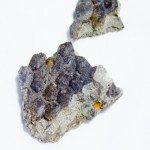 In June of 2012, Bell’s team came upon a cliff that had collapsed to reveal bits of dinosaur material. “I first picked up a bit with skin impressions, and I thought, great, there should be more in there,” says Bell. “We immediately changed our approach to make sure everything was kept in pristine condition. Soon, we hit upon a section of skin that was glossy and black, unlike anything I had ever seen in the field before. We looked at it closely, and realized that it had a three-dimensional structure.” While skin impressions are not unheard of, only one or two examples of actual preserved skin samples from any dinosaur have ever been found. 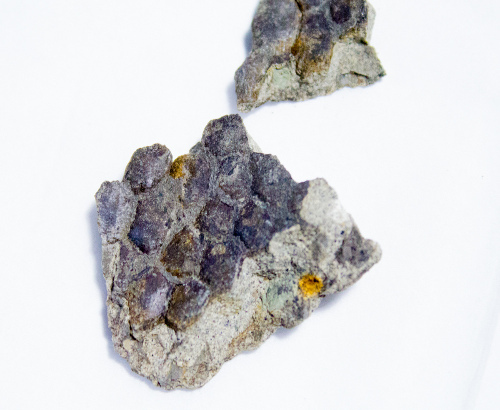 This sample of well-preserved hadrosaur skin, found near Grand Prairie, Alberta in the summer of 2012, is currently undergoing analysis at the Canadian Light Source, a particle accelerator in Saskatoon, Saskatchewan. The data could help us learn what colour dinosaurs actually were. Image credit: Canadian Light Source. Bell showed the sample to his collaborator Mauricio Barbi, a high-energy physicist at the University of Regina. Although physics may seem far removed paleontology, for Barbi the chance to do field work is the fulfillment of a childhood dream. He comes along to digs whenever he can, and he was just as excited by the skin as Bell. “I remember one of the technicians looking at us like we were crazy; we were laughing and talking about projects we could do with it,” says Barbi. One of the possibilities involves looking for melanosomes, small structures within cells that contain the pigment melanin. In recent years, paleontologists from Britain, China and the US have used scanning electron microscopes to analyse melanosomes found in preserved dinosaur feathers. By comparing their shape, size and distribution with those of modern birds, they’ve been able to make educated guesses about the colours of a few dinosaur species. Doing the same in skin would cross a new frontier. “It has never been done before,” says Barbi. 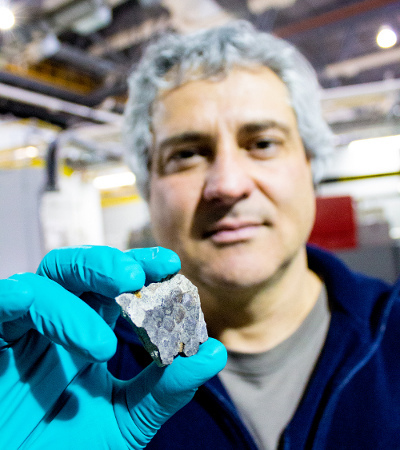 Mauricio Barbi, a high-energy physicist from the University of Regina, uses the intense, highly focused light from CLS to probe the chemical and atomic structure of the dinosaur skin for clues as to its origin and original colour. Image credit: Canadian Light Source. Philip Bell also happens to be the head paleontologist for Canada’s newest dinosaur museum, currently under construction and scheduled to open in 2014. Find out more about the project at curriemuseum.ca. Very interesting. I had never heard of the CLS.